All of Friday night clicked together very neatly for us when Iran fronter Aaron Aites mentioned that he had written the song "I Already Know You're Wrong," a highlight of the Brooklyn-based quartet's supporting set, with Peter Hoffman. This name might not mean that much to you unless, like us, you are a very big fan of the late, lamented The Mendoza Line, which in its heyday was fronted by Mr. Hoffman, Timothy Bracy and Shannon McArdle. According to Wikipedia, which we all know to be completely infallible, apparently Hoffman was once a full-fledged member of Iran, as was TV On The Radio's Kyp Malone. This latter fact, Mr. Malone's membership, was the only thing we knew about Iran before we took in the set Friday night; he was not with the band Friday night. After Mr. Aites mentioned Hoffman, he tossed off a casual comment about Hoffman having played with Mendoza Line, and that Mendoza Line's Tim Bracy had been playing with opening act Wooden Wand. This was complete news to us, and we certainly would have detached ourselves from the bar at the front of the building to see Wooden Wand had we known there was a possibility Bracy was performing. So we're almost lacing this together -- the final salient fact is that Mr. Bracy was/is a partner in Misra Records, which released some earlier Destroyer records. See how it all ties together? It would seem that the bill last night was all strung together through that Misra connection, even though Iran's records are released on Narnack, Destroyer is now on Merge and Wooden Wand is, we think, on Young God. So the show... our only familiarity with Iran was a promo track that circulated the Internerds sometime last year, and frankly we weren't that crazy about it. So when we wandered in to catch the Iran set it was mostly to see whether Mr. Malone was still with the combo and whether any of Iran's other material grabbed us. The answer to the former question, as we already stated, was no. But Iran's other material definitely did grab us, even more so than the recorded stuff, which we've since purchased from EMusic. The musicianship was admirable as well: the rhythm section was dynamic and punchy, and Mr. Aites presentation and delivery made us think of Steve Earle a little bit. He just stands there and sings, a bit like Joe Cocker, sans animation, but Aites' voice is heavy like lead. Good stuff. We found Iran's guitarist's handlebar mustache amusing, but were on the wrong side of the hall to really see what he was up to. As we noted supra, Destroyer's Dan Bejar -- worshiped a little too much by the self-consciously loquacious younger fans standing around us, we thought -- came out under the spots sporting only a red Guild acoustic, his voice, a couple Stella Artois bottles and what might have been a heavily poured dram of liquor in a plastic cup. Or it could have been tea with honey. That wouldn't surprise us. 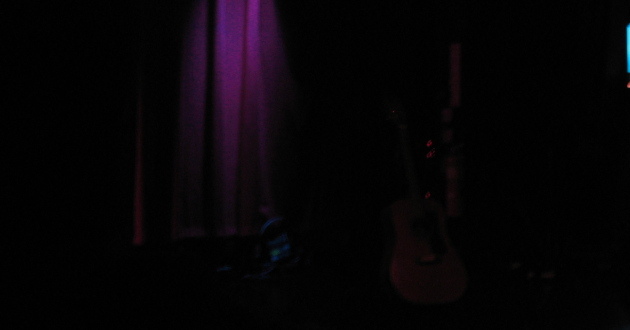 Anyway, despite the completely minimal set-up, Bejar was arresting to watch and listen to. We've read one or two interviews where Bejar talks about how it is not just the turns of phrase, but how he turns those phrases with his mouth, that interests him. The combination of the two is what he's built his career on, and we certainly admire both. There are honestly few lyrical geniuses, and Bejar is one of them, and the fact that he's matched them to gripping songs is all the more amazing. We were very pleased with the solemn iteration of "Foam Hands," and Destroyer offered numerous other hits for the cardigan set, including "European Oils," "Painter In Your Pocket," "Watercolours Into The Ocean," "Farrar, Strauss & Giroux" and "This Night." YouTube Rodeo: The Hush Now's "Constellations"
YouTube Rodeo: Calories' "Forests of Varg"
Rock Over Boston: O Positive returns!